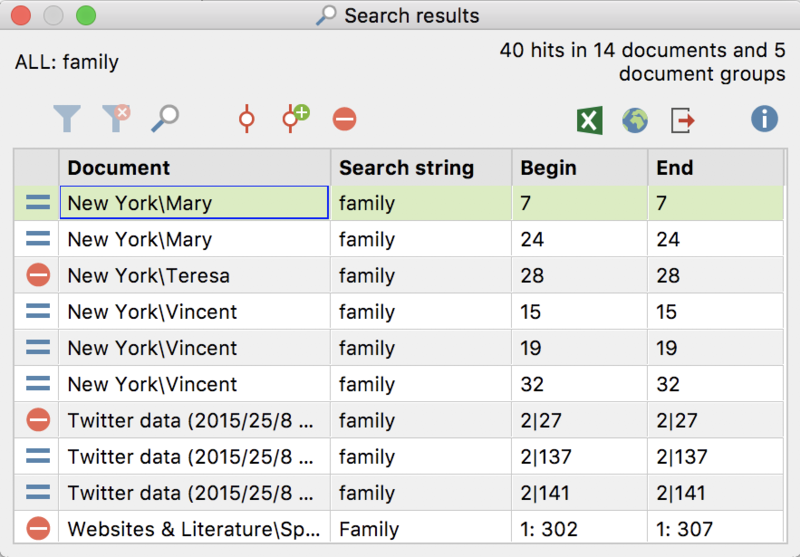 Like the segments in the “Retrieved Segments” windows, lexical search results can be automatically coded, meaning all text passages found in the search are assigned as specific code. This automatic coding has the advantage of being easy and reliable. The disadvantage, however, in comparison to manual coding, is of course that you can’t examine the relevance of each respective text passage during the coding process. The occurrence of a specified string in the text automatically triggers the coding. For example, if the word “Mother” is automatically coded with the code “Family”, references to “Mother Earth” would also be included. The best way to code search results automatically is to click on the Autocode search results with a new code symbol. In the dialog box that appears, enter the new code and click OK. The new code will be inserted at the top of code system. In the ensuing options window you can set the range before and after the search term as well as the weight, which is established during the coding process. In the “Code” field, you establish with which code MAXQDA should assign to the search results. The “Quick list of codes” – which lists the most recently used codes – is displayed in this window. The code that you created earlier is automatically selected here. Furthermore, a weight value can be set for all coded elements, that is to say, all segments will be coded with the same weight. 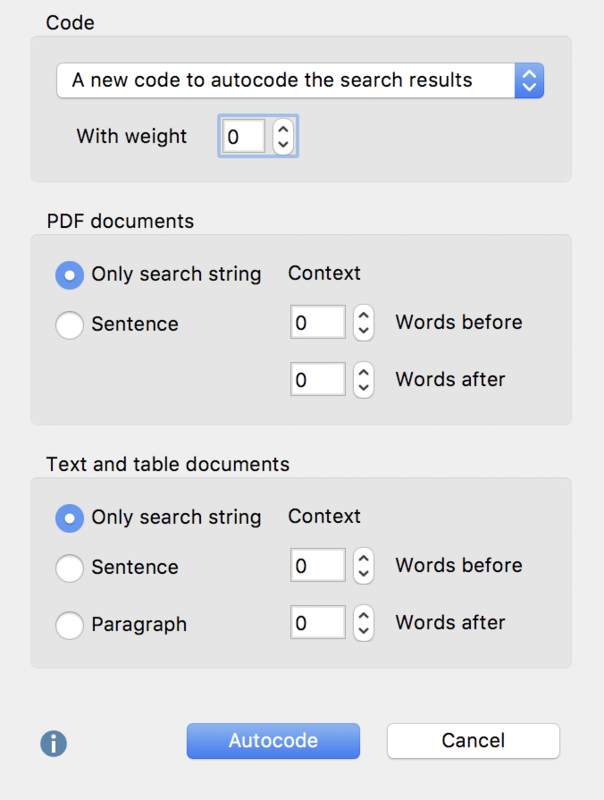 In the “PDF documents” field, you can set whether only the respective search result should be coded, or whether additional words or sentences before and after the search results should be coded as well. In the “Text and table documents” field, you can also determine if whole sentences or paragraphs before or after the search result should be coded. The setting 1 Paragraph after means that the paragraph in which the search term is found as well as the following paragraph will be coded. Again, if the term appears several times in one paragraph, it will nevertheless be coded only once. 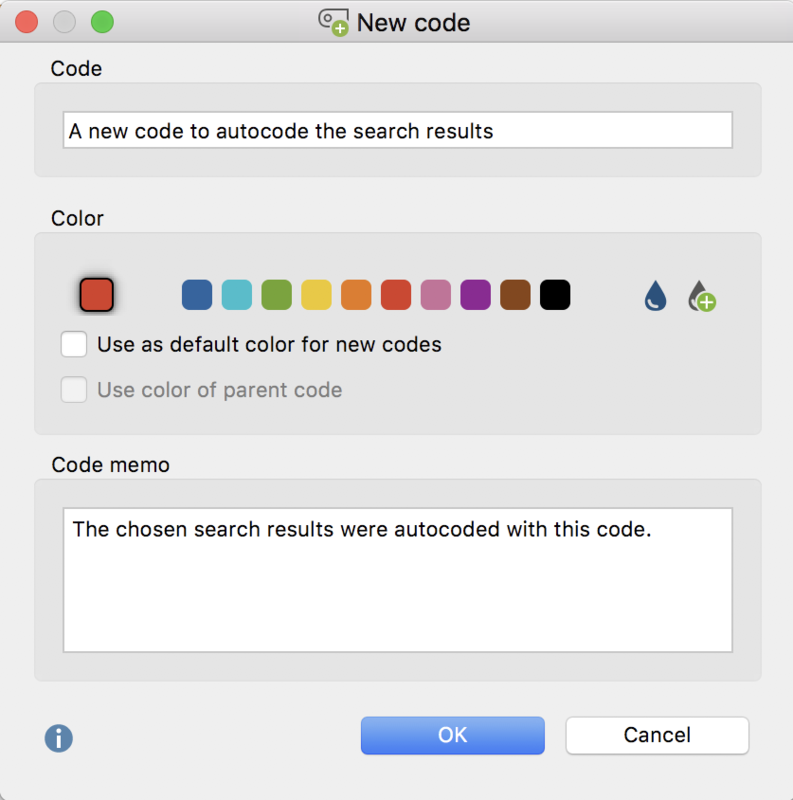 Please note: If you do not want to code with a new code, but with an existing code from the “Code System”, you can use the Autocode search results option. Before you start the process, click on the desired code in the Code System, which will cause the code to appear in the list of recently used codes in the Autocode options window. Fundamentally, all search terms that appear in the results list will be autocoded. However, before executing the autocode function, you can review the list of search terms in order to decide whether each term should be included or not. Once one or more lines in the results table have been selected, click on the red icon Autocode/Export: ignore hit in order to exclude the entry. The fastest way to exclude a term is to double-click in the first column. Please note: The selected codes are incorporated into the undo coding list which can be accessed from the Code toolbar with the icon. This action can be reversed with a single command if necessary.